EGU Blogs » GeoLog » GeoPolicy: Horizon Geoscience! 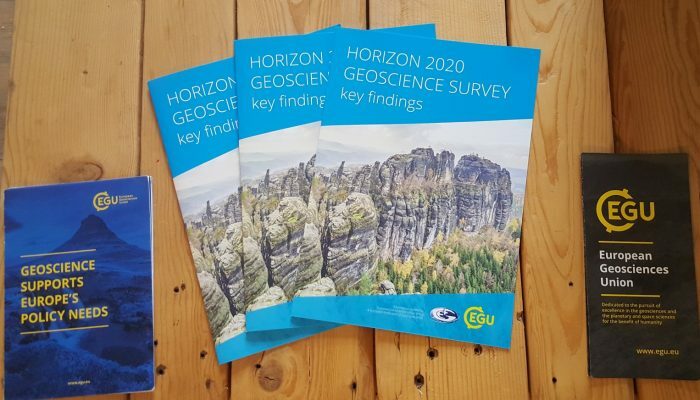 For the last few months the EGU has been working towards both hosting a dinner debate in Brussels, Belgium, and publishing the Horizon 2020 Geoscience Survey Report which was based on a survey conducted within the geoscience community earlier this year. Both of these endeavours were undertaken together with the European Federation of Geologists (EFG) and had similar aims: to enhance collaboration between policymakers and scientists and to improve the geoscience community’s science-policy engagement. Earlier this year, the EGU together with the EFG, conducted the Horizon 2020 Geoscience Survey to collect feedback on areas of the EU’s Horizon 2020 research funding programme that the geoscience community felt should be continued or extended and those which could be improved upon in the upcoming EU research framework programme, Horizon Europe. This survey was conducted during the 2018 EGU General Assembly and many of you may remember either completing it or seeing posters around the convention centre advertising the opportunity. Due to its thematic diversity and its size, the geoscience community has a significant representation within European research programmes. 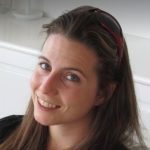 The survey aimed to give researchers who have taken part in Horizon 2020, or who plan to take part in Horizon Europe, the opportunity to voice their opinion. 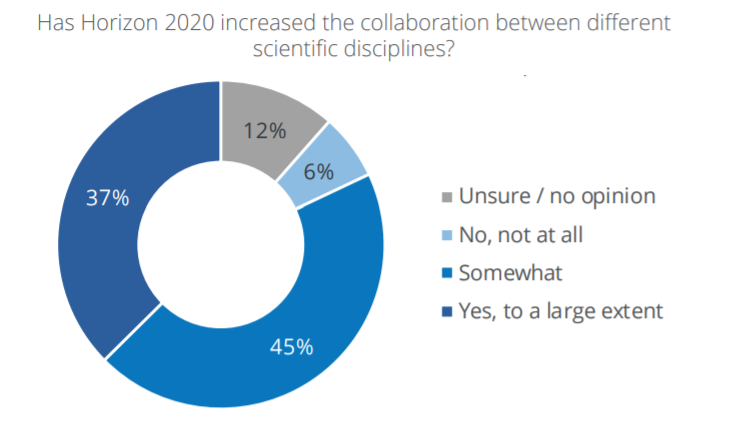 Although the survey asked a wide variety of questions, only those where clear results were found were included in the Horizon 2020 Geoscience Survey Report. However, all of the survey responses (quantitative and qualitative) can be seen online here. Qualitative responses supported by the quantitative answers and cited by numerous survey respondents were also included in the report and give insight into some of the answers from respondents. 2. Despite many areas within the geosciences being used by the private sector, survey respondents generally felt that Horizon 2020 had only been moderately successful in generating private sector investment within the geosciences. 48% of respondents believed that the programme was somewhat generating private sector investment, but only 6% thought it was generating it to a large extent. 3. 24% of respondents thought that the distribution of projects between applied and fundamental research was not fair at all. For more details on these results and others, please read the full Horizon 2020 Geoscience Survey Report. The Horizon Geoscience dinner debate was held on the evening of September 26 in Brussels. Co-organised by the EFG, the event included a mix of scientists, industry leaders and policymakers from a range of different areas within the Commission. The evening was opened by both the EGU President Jonathan Bamber and the EFG President Vitor Correia. As EGU’s policy officer, I presented some of the key results from the Horizon Geoscience Survey, after which Iain Stewart set the scene for the evening. Some of the key things that were mentioned during these round-table discussions included the importance of increasing public trust in both science and policymaking, the need for greater dialogue between the sectors, and the need to integrate early career scientists within industry, academia and policy. For an extensive summary of the dinner debate please see the EGU news item, EGU and EFG establish dialogue with policy makers on how the geosciences can help overcome Europe’s major societal challenges. If you have any questions regarding the report of the Horizon Geoscience dinner debate, please don’t hesitate to get in touch via policy@egu.eu.